I first started reading this book almost a year ago. I'm glad I didn't continue reading it back then, I'm sure I wouldn't have appreciated it as much then as I did now. 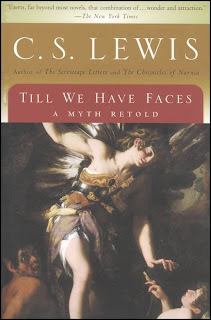 Till We Have Faces is a retelling of the myth of Cupid and Psyche and if you haven't the slightest clue what it is, it's a good idea to read up on it (that's what I did) before reading the book. The book is also the last novel C. S. Lewis ever wrote and the only thing I've read by him. The book has two parts. The first is the story, as narrated by Orual, Psyche's half-sister, a woman with a disfigured, unpleasant face, which she hides under a veil. Orual bitterly accuses the Gods of being unjust and writes her side of the story as a complaint against the Gods, even a challenge of sorts. It's a finely written book, which has a lot to say. I'm not sure I understand all of it, or if I ever will. But I do like how it made me really think; think for two days before I went ahead and wrote this post. The first part was interesting, in the way all mythology is, very crude and insanely fascinating; disturbing and beautiful at the same time. But it was in the second part (not Part II but the second half of the book) that it became smart, you know: that's when you realize the whole point of having a retelling. It's not a Peter Ackroyd retelling, the whole idea of which is pretty much to make things more 'accessible' or easier to read. The revised story here makes a point, the new perspective has a purpose and it's a good one. The book adds the human aspect to a myth, expands on feelings, thoughts and dialogues and makes the myth all the more real. You can hardly relate to mythology, I mean, come on. But here you really can put yourself in Orual's shoes and that's one of the things I liked (or understood... I think?) about the book. "Now mark yet again the cruelty of the gods. There is no escape from them into sleep or madness, for they can pursue you into them with dreams. Indeed you are then most at their mercy. The nearest thing we have to a defence against them (but there is no real defence) is to be very wide awake and sober and hard at work, to hear no music, never to look at earth or sky, and (above all) to love no one." "I was not a fool. I did not know then, however, as I do now, the strongest reason for distrust. The gods never send us this invitation to delight so readily or so strongly as when they are preparing some new agony. We are their bubbles; they blow us big before they prick us." "A fat fly was crawling up the doorpost. I remember thinking that its sluggish crawling, seemingly without aim, was like my life, or even the life of the whole world." "It was the hardest work I'd ever done, and, while it lasted, one could think of nothing else. I said not long before that work and weakness are comforters. But sweat is the kindest creature of the three— far better than philosophy, as a cure for ill thoughts." Have you read Till We Have Faces? P. S. This is another read for the Once Upon a Time Challenge. My next book for the challenge is on its way: The Ocean at the End of the Lane. That's right: Gaiman's latest novel, I can't wait to start reading it. Have you read the poem "Ode to Psyche" by Keats? He doesn't really explore the actual myth very much but I think it would be an interesting companion piece here. I have not read this C.S. Lewis interpretation but you convinced me to check it out. Great review! i don't tend to like "re-tellings" of fairy tales, myths, etc. but i remember liking this when i read it. i'm not sure why i found it different. i love that last quote you selected.